Global consumers ramped up purchases of physical gold in the second quarter of the year, causing a staggering 53% increase in the total demand for bullion, driven mainly China and India, says the World Gold Council's latest report. According to WGC there is renewed interest in gold due to its falling prices, which has brought total purchases of gold jewellery, bar and coins to 1,083.2 metric tons. 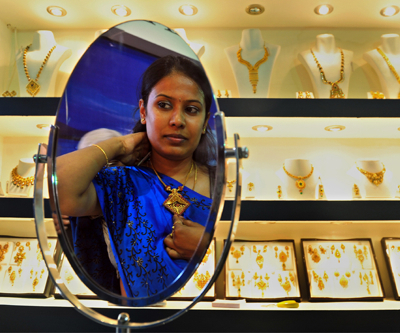 Jewellery demand reached its highest level in 5 years, increasing by 37% to 576 tonnes. Chinese demand was up 54% compared to the same period last year, while India bought 51% more gold ornaments than in 2012. Bar and coin investment surged by a significant 78% across the world and topped 500 tonnes in a quarter for the first time. China’s appetite for gold bars and coins grew by 157% compared with the same period last year, while in India it jumped by 116% to a record 122 tonnes. The WGC statistics come on the heels of India’s recent measures to curb gold purchases because it is the most costly non-essential item that the country imports. In June the organization said it expected China to surpass India as the world's No. 1 bullion consumer this year as New Delhi steps up restrictions to curb gold imports. But overall demand for the precious metal still fell 12% compared to last year.